Celebrating Thriftiness: How to Hide a Stain in a Nice Shirt! We have been given lots of beautiful clothing for the kids over the years. They come from family and they come from children of friends who don’t fit them or need them anymore. Often I am given a big bag of wonderful bits and pieces and we take what we need and pass the bag on. 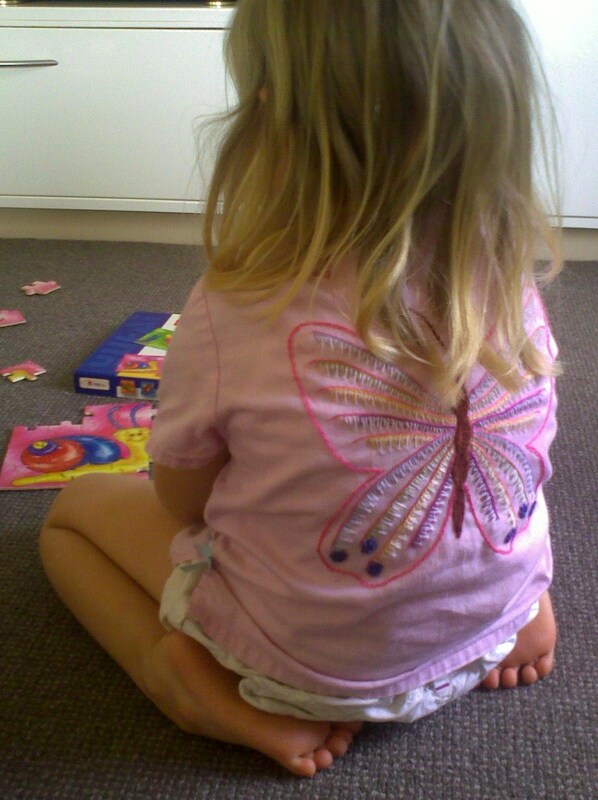 I’ve had to buy the kids very little clothing over the years, actually! One of the wonderful gifts was a little pink shirt with an oriental collar, pearly buttons and butterflies machine embroidered on it. Rosella is neither here nor there about it, but I love it and I felt really sad when I found that it had been tossed off the verandah onto a part of our garage floor that we hardly visited, and sat in a puddle for probably two weeks. I washed it and soaked it and scrubbed it and it mostly came good except for a big brown stain on the back. The stain didn’t bother my daughter because she couldn’t see it, but I could! Not ready to toss the shirt, and not able to pass it on to anyone with a big stain on it, I decided to cover it. I could have cut out a patch in some nice fabric and machine stitched it on, but NO – I decided to embroider an elaborate and very large butterfly – much larger than the stain!! Fortunately about the time I was taken with idea, we were spending the weekend at my parents place, where the kids disappeared and happily played and pottered about – and I had the opportunity to virtually disappear behind my embroidery, not emerging until the butterfly could stretch it’s pretty wings. I found mum’s book of crewel embroidery stitches and tried out some new ones. The butterfly’s body is made with cretan stitch, and the wings have chain stitch, long and short blanket stitch, french knots and a few woven spider webs (my new favourite embroidery trick!). Now do I hear you say “I wish I could embroider”? No excuses! Embroidery is great because it is work you can take with you anywhere, and do a bit at a time. You can trace a picture you like or draw one of your own, and then choose which stitches to use. Crewel embroidery is very flexible, has no rules and you can learn new stitches easily with online tutorials. Even youtube have embroidery tutorials. You can make anything beautiful when you know a few basic stitches. 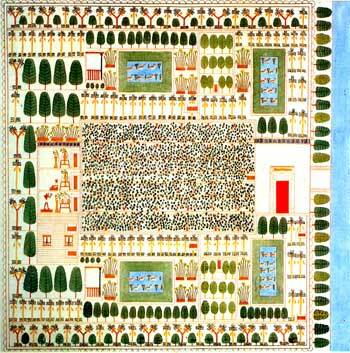 With just three stitches my grandmother embroidered a massive copy of this Egyptian picture of the garden of a high official of Amenhotep. My grandfather copied the design and sketched it out for her onto the fabric and she embroidered it. It now hangs in my parents house and I love looking at it. So simple and so amazing! On a much smaller scale, I have a new long-term embroidery project. My friend gave me a pair of camouflage print shorts and even though I am not a fan of wearing camouflage I kept them because they actually fit me (a rare occurence! I never pass up clothes that actually fit!) so I am making them pretty with embroidery. Will show you what I’ve done with them when I’m finished … or maybe before then because who knows when that will be!! I guess that is what I am doing with my shorts … it is flowing at its own pace and the design just grows from where I left off last time. Went through a bit of a paisley thing at one point, then a geometric pattern thing, now spiderwebs are cropping up everywhere. I’ll probably never wear them because they will never be finished!